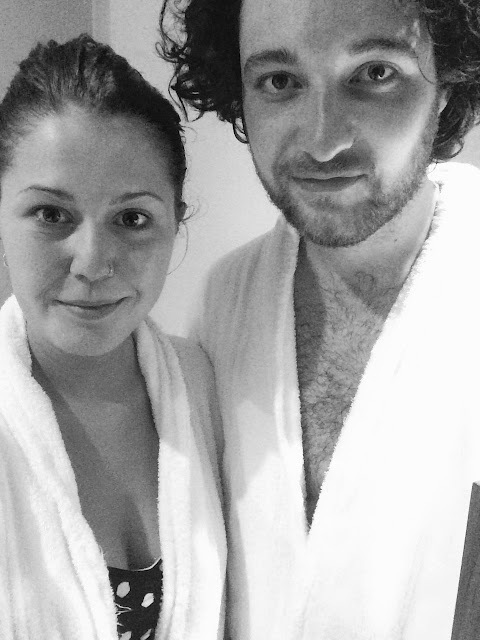 Last week H and I had a few days in Harrogate to celebrate me turning 25 *cries*. We had the loveliest time and the weather was great. Turning 25, however, just made me a feel a bit emotional and like I'm getting on a bit. I was in desperate need of a few days away so it couldn't have come at a better time. I searched the web for somewhere to stay. I came across the incredible Lawrance Apart-Hotel. 5* Luxury apartments with two locations Kings Road or Duchy Road. We were at Duchy, basically a 10 minute walk from everything you'd probably want to see or do that's central. I could obviously time how long it took thanks to H, he bought me this beeeeautiful new watch from Kapten & Son. We arrived on the afternoon of my birthday (I share my day with the Queen!) and checked into the apartment (self check in with keys in key boxes by the door - so straight forward) and were blown away by what we were met with. A free update to a ridiculous 2 bedroom apartment. It was so beautiful. Big kitchen, living room and dining area with free tea, coffee and hot chocolate facilities, even a little carton of fresh milk to greet us. A massive master bedroom complete with chandelier. Another lovely second bedroom. Both bedrooms with ensuites and lovely views too. A lovely seating area outside with views of the fields in the garden. It was honestly perfect - to the extent that I could genuinely live in that apartment. We spent the rest of the afternoon sat outside drinking wine in the beautiful sunshine (and warmth!!!) before heading to Burgers & More for dinner in the evening. Now, I'd read a few bits and pieces on the internet about this place, all stating great burgers. I can say, the burgers were really good but the presentation of the meals and the overly surroundings/atmosphere weren't the best. The following day we got up and headed to the Farm Bistro for breakfast. Cannot rate this place highly enough. Local ingredients, everything super tasty, really friendly and helpful staff (we both requested things that weren't actually part of the meal we ordered) and overall just really, really good. I'd probably have eaten breakfast there the following day if I hadn't got somewhere else in mind. From here we had a little potter around the town and nipped into a few shops before heading down to the Turkish Baths for an afternoon of pampering. We opted for the Sacred Nature Face and Body Ritual - a full body exfoliation, massage and facial with organic products - which was hands down the most relaxing hour and a half of my life. The bath's themselves were great and made up of showers, a steam room, three heat rooms, a plunge pool and relaxation room. H was a bit disappointed there was no actual swimming pool but I was too relaxed to even notice. We both left feeling silky smooth and cleansed...and in need of a nap. We popped and grabbed a sandwich before heading back to our dream apartment. That evening we met H's cousin for dinner at their local pub, The Square and Compass. Weirdly enough, this was a place I'd read about on TripAdvisor and fancied trying so a welcome choice from them! I'd already had a little too much Prosecco by the time we'd arrived so couldn't make a decision on food at all. I ended up with three sharing plates as a main - the quinoa with pomegranate, grapefruit, avocado and minty yoghurt, the scallops cured in chilli and lime with avocado and the sticky baby chorizo on creamed cannellini beans. All of which were wonderful, especially the chorizo. The others had the crispy beef salad and the three mini burgers - all giving glowing feedback. I also had the best sticky toffee pudding that has ever graced my mouth! Unfortunately I didn't snap any photos here as they'd never met me before and I was too engrossed in conversation and glasses of Prosecco that kept magically appearing in front of me. The following day, we headed to Betty's (with sore heads) for brunch. I've been to Betty's before for afternoon tea but the all day breakfast menu looked too good to resist. We actually had to queue for twenty minutes to get a table but apparently that's pretty good going on a Saturday morning! We sat down at a window seat, overlooking the incredibly popular picture framed seating area that everybody and his dog had a photo in front of. It took me a while to decide what to eat (again), mainly because of how thirsty I was (two orange juices and a pot of tea sorted me out eventually). I eventually decided on the Eggs Florentine Rosti with a side of bacon and H had the full English. The food was up there in the top 3 breakfast/brunches I've ever had. The rosti was perfect and it makes my mouth water every time I think about it...Betty's is definitely not the cheapest place in the world (£45 for two of us because we were overly thirsty) but it's 100% worth going to. The afternoon tea is definitely worth trying at least once but the cakes are actually around 50% cheaper to buy and take away from the shop BUT I know that ruins the afternoon tea vibes. From there we had another little wander around, popping into Lush for more things I didn't need and Molten Brown, just to smell everything. On the way back, we went via York Designer Outlet village, somewhere I'd genuinely recommend popping into if you're ever in the area. Not only do they have a Margaret Howell outlet shop but the Levi's shop had some really good bits in (picked up a Made in the USA Denim Jacket for £25 - mega bargain!!) and the Reiss shops are pretty darn good too. A quick little round up, I know, mostly about eating but y'know, I like pottering about and eating in different places. We're already planning our next visit to Harrogate and I think you should too! Also, make sure you check out the Lawrance - they have places in both Harrogate and York. Perfect for a little getaway! I loved Harrogate when I visited last month, we were just passing through but we headed to The Farm too and loved it just as much!! I definitely need to visit Betty's, one day I will!